Happy (Belated) New Year! Lots of people make New Years resolutions to eat healthier, so I figured why not kick off 2014 with a nutritious recipe? 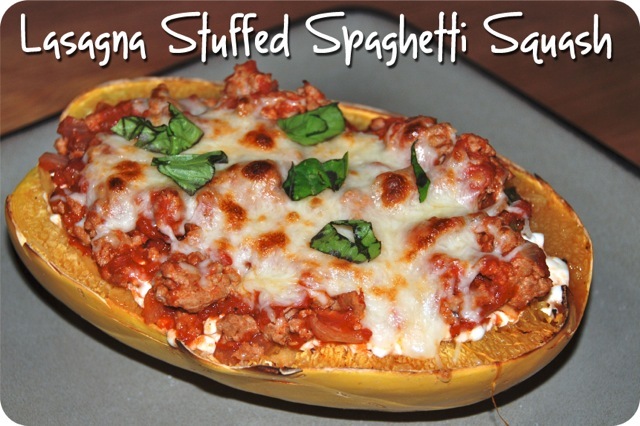 I’m sure most people have heard of substituting spaghetti squash for pasta by now. Personally, I don’t think it tastes like pasta. But luckily, I LOVE veggies, and while I don’t think this is a “pasta” dish, I think it’s a super delicious veggie-filled meal! I was a little nervous to serve this to the hubby but– surprise of all surprises– he loved it! He talked about it for DAYS afterwards. Freezer Breakfast Sandwiches – This was the top post by a LANDSLIDE, thanks in large part to Pinterest. This post was pinned over 162,000 times, was viewed 233,573 times and received 91 comments. It has officially been my most successful post, which is funny considering I almost didn’t even post this pseudo-recipe! Buffalo Chicken Pasta Salad – This post was actually from 2012, but apparently has some staying power. It was the 2nd most popular recipe in 2013 and for good reason– it’s amazing! Beer Cheese Dip – I made this recipe for New Year’s Eve last year, and a year later it holds the #3 spot! It’s easy and delicious– a winning combination. Blueberry Cheesecake Cookies – This recipe was also from 2012 and I attribute its popularity to its uniqueness! “Blueberry Cheesecake Cookies” was my top search engine hit for the year as well. Crock Pot Roasted Whole Chicken – This recipe, posted in May, skyrocketed to the 5th most popular recipe pretty quickly. Another easy recipe, proving home cooks love ease! Well that was fun! Looking forward to 2014. My biggest resolution is to start posting more often. The second half of 2013 slowed down considerably, but I’d love to get back in to it. Thanks to all have stuck with me! Preheat oven to 400 degrees. 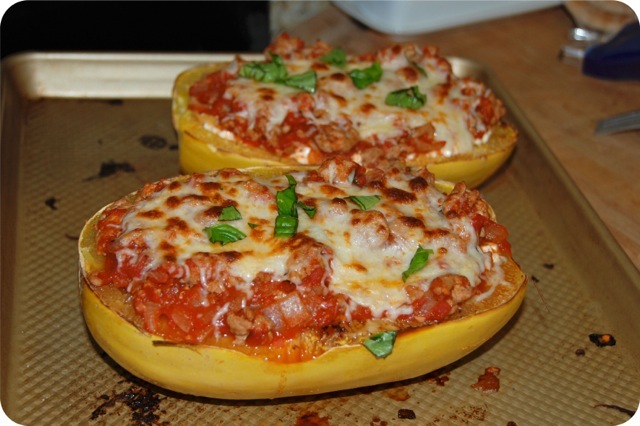 Brush the insides of the spaghetti squash with oil and season with salt and pepper. Place the squash skin side up on a baking sheet and roast 30 minutes, until tender. Meanwhile, heat the oil in a large pan over medium heat. Add the onion and cook until beginning to soften, about 5 minutes. Add the turkey to the pan and cook, breaking it up into the onions, until cooked through, about 8-10 minutes. Add the garlic, red pepper flakes, and fennel and cook until fragrant, about 1 minute. Add the tomatoes, tomato paste, Italian seasoning, bay leaf, paprika, balsamic vinegar, salt and pepper. 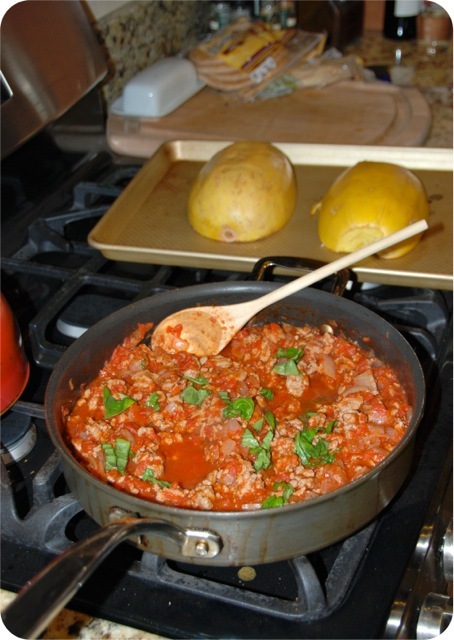 Bring to a boil, then reduce heat and simmer until the spaghetti squash is cooked. Remove sauce from heat and stir in the basil. Fluff up some of the inside of each spaghetti squash half, divide the the cottage cheese between them followed by the sauce and the mozzarella. Would you by any chance have any meatless recipes?? Hi Cindy! Check the Recipes tab at the top of the page… then go to “Dinner Recipes”… there is a section near the bottom with meatless meals! I loooove spaghetti squash. It isn’t always the most filling, but with meat sauce or meatballs (for my husband, I don’t eat meat) it’s definitely a meat. And it’s fun to eat out of the “boats”! I’ve always cooked my spaghetti squash cut side up. I wonder if it really makes a difference? Any thoughts? Hey! Looks delish! I’m going to try this out tonight. What is a serving size though? 1/2 a squash? My hubby (who is a big eater) ate a whole half… I had about half a half… and the rest for lunch the next day! Such a delicious and bright looking dinner! Thanks for posting this at the Saturday Night Fever link party. Hope to see you back on Saturday!